Pictured: Me trying to get a hand cannon Invader kill in Gambit. If you notice an unusual number of players using hand cannons in Destiny 2 this week, it’s because they’re probably trying to unlock an exotic weapon called Ace of Spades. It’s a long, occasionally annoying quest, but I am happy to report that it is also super worth doing. Spoilers for the Ace of Spades quest and the main story campaign of Destiny 2: Forsaken follow! Ace of Spades is an exotic hand cannon that first appeared in a slightly different form in the first Destiny. Until the start of Forsaken, it was the property of Cayde-6, the charming robot hunter who met his unfortunate, widely publicized demise at the start of Forsaken’s campaign. In Forsaken’s opening mission, your Guardian and Cayde head off to investigate what appears to be a routine disturbance at a place called the Prison of Elders. It turns out to be anything but routine, and at the end of the quest, a villain named Prince Uldren takes Cayde’s gun and kills him with it. You spend the rest of the campaign hunting Uldren down, and in the closing story mission, you finally reclaim Ace of Spades from him. The gun is broken, though, and one of your initial endgame exotic quests involves completing a number of challenges in order to fix it. I stayed up way too late last night finishing the quest and getting Ace of Spades. I am here to tell you that while the quest occasionally made me tear my hair out in frustration, I’m really glad I did it. Not only is the weapon itself incredibly cool—like, seriously, maybe the coolest hand cannon I’ve ever used in Destiny, and I’m including Fatebringer and The Last Word in that comparison—the quest itself also helped me get better at the game in some specific ways. As a bonus, it wrapped up with an unexpectedly thoughtful narrative tribute to Cayde. Here are all the main steps to get Ace of Spades, along with a few thoughts on how I completed each one. 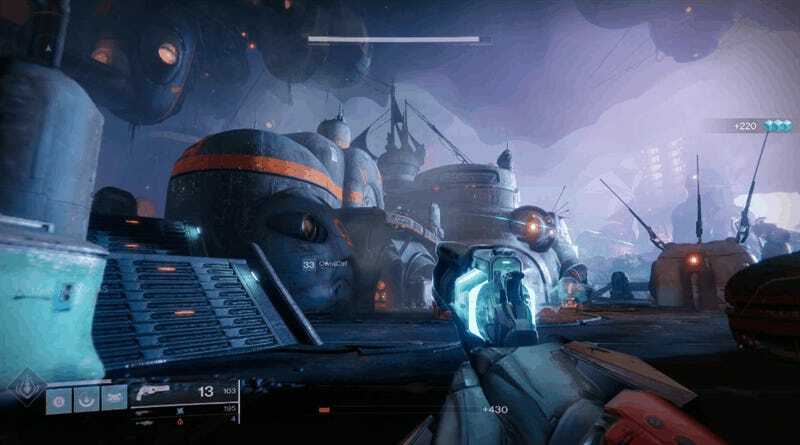 Before you get to these challenges, you’ll need to finish the final story mission of Forsaken, titled “Last Call,” then visit Banshee in the Tower. This is easily the hardest step in the quest. It’s too bad that it’s also the first one, since it’ll doubtless scare off a lot of players. It’s also confusingly worded as “get 5 invasion kills,” but you don’t have to get kills as the invader, you have to kill invaders who come over to your side. 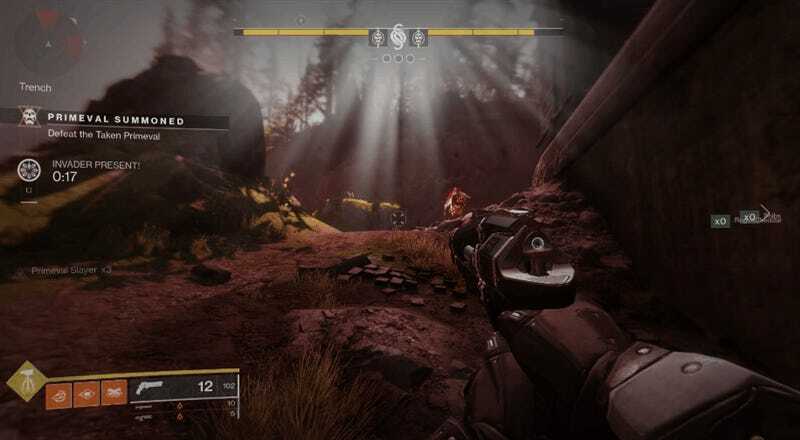 If you’ve played any Gambit, you know how daunting that is: people tend to invade when they either have their super up, have heavy ammo loaded into a mighty weapon like Sleeper Simulant, or both. They have an overshield that makes them more powerful than anyone on your side, and their HUD shows them the location of everyone on your team. Those advantages can make it really, really hard to take them down with a mere hand cannon, particularly given that you have to get the final blow. Assists don’t count. I cannot describe to you the relief I felt when I finally got to five. I’m sure stronger competitive players will have less of a problem with this step of the quest, but it was almost enough to make me throw in the towel. 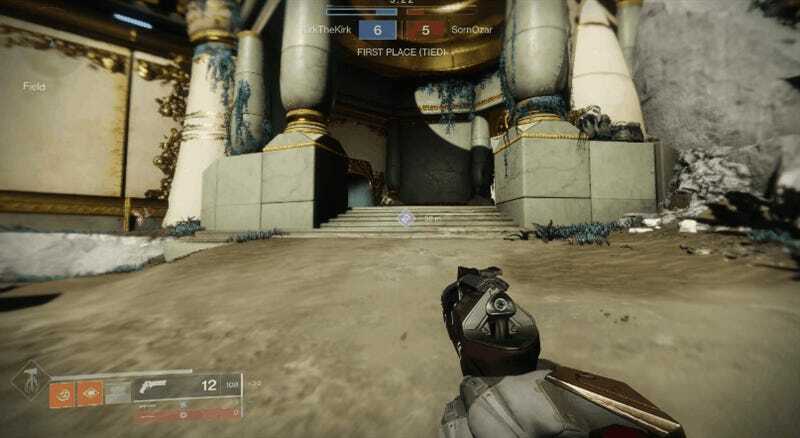 It’s also the one step that I think is arguably poorly done, because it encourages players to play Gambit “wrong.” For a lot of players, finishing this step will mean ignoring objectives in favor of camping and waiting for invaders. I saw a lot of peculiar behavior over the weekend that indicated that a lot of players in my games were chasing Ace of Spades. Often, entire teams would simply refuse to invade our side, likely because they were all waiting for us to come to them. Then again, the Gambit step did teach me how to focus on and call out invaders on my own side, and it’ll doubtless be less of a pervasive problem once this first wave of people complete the quest and move on to other things. And it wasn’t that hard to get done, so, bygones. If you’re stuck on this step, a couple friends of mine revealed the best way to do it: as a team. We loaded in together, and my buddies would call out invader locations to me, damage the invader, and try to let me get the finishing blow. I was the only one who needed help since they’d already finished the first step, but you could do it with a group and take turns getting kills. There were times the invader got us, of course, and times my buddies accidentally stole my kills. But it only took a few games for me to get to five. 2. Get 250 hand cannon kills in strikes. This one’s a cinch and a pleasant follow-up to the stress of the Gambit challenge. It’s also a good excuse to go do the new Forsaken strikes, since you don’t even have to get these kills on Heroic strikes. If you played the first Destiny and haven’t done the new Prison of Elders strike, do yourself a favor and check it out. 3. Get 25 hand cannon precision kills in Crucible. I started doing this step in the quickplay playlist and initially thought it was going to take a while; then I remembered that there’s also a rumble playlist. Rumble is basically nothing but 1:1 gunfights, and it’s a really fast way to get through this step. It was also helpful for me to have to drill down and focus on my hand cannon accuracy, since I tend to get kind of sloppy ordinarily. By the time I’d finished, I was hitting way more crits than I had been at the start and, fittingly, even won the last rumble round where I topped off the quest. 4. 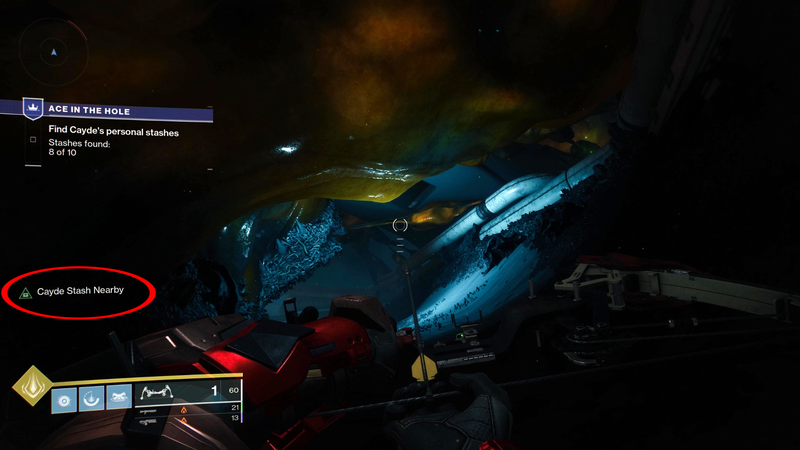 Open the “Cayde’s Stash”-style chests hidden in four different locations. Each of the chests you find includes a letter from Cayde with a little story that you can read in the Lore section under the Triumphs tab in your menu. I won’t break down all of them here, but the stories are worth reading if you like the fiction of the Destiny-verse. Cayde talks about life as a robotic Exo, his past lives as Cayde-1 through Cayde-5, and sheds some light on his thoughts regarding a variety of characters and events from over the years. The final step is to complete an all-new mission located on Titan. Rather than give you one last stiff challenge, the Ace of Spades quest instead doubles down on narrative payoff. Once again you have to find Cayde’s stashes. This time there are ten, and they’re placed along a path within the Hive-infested underworkings of the Titan Arcology. You’ll see a notification in the corner of your screen when you’re near a stash chest, and as long as you don’t move too far forward without getting each one, you shouldn’t have too much trouble finding them all. Just remember that a lot of them are hidden above you, or are hard to see unless you move forward and look back the way you came. Keep an eye out for this notification in the corner of the screen. Cayde has apparently decided that whoever kills him gets to keep his stuff, and each chest is a message to one of the main characters who he assumes offed him. Nolan North, the actor who filled in for Cayde’s original actor Nathan Fillion for Forsaken, does a fine job capturing the cadence of Fillion’s performance. “This one’s for Eris Morn,” he says in the first message, addressing a widely liked weirdo who hasn’t yet appeared in the sequel. “If you’re listening to this, congrats on killing me! I assume you became a Hive death god and fed me to your worm cult. That or you just finally got sick of me. Coincidently, if you didn’t kill me and still somehow hear this, I’m sorry for stealing your ship. And, well, pretty much every other interaction we ever had. But to be clear: if you did kill me, I do not apologize, and I will consider all my actions one hundred percent justified. Either way, feel free to put your rock on my maps now.” All the message are similarly loaded with callbacks and in-jokes for longtime fans. 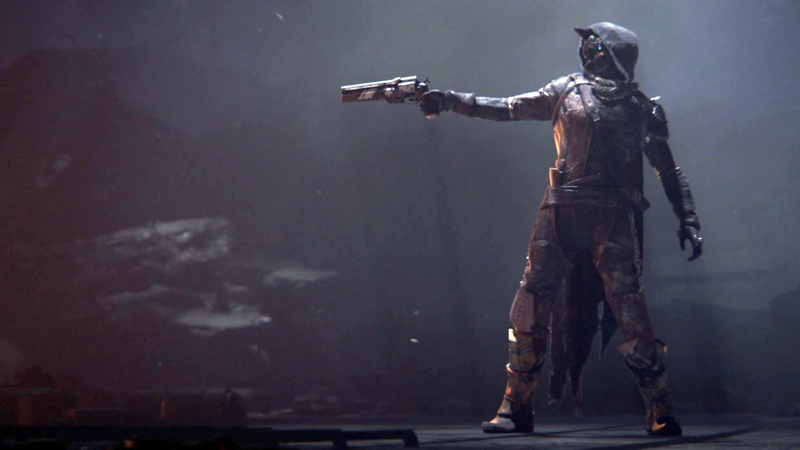 Cayde’s message to Ikora Rey is particularly good, and his message to the Drifter offers an enticing tease for what the game’s future may hold. 6. Go get Ace of Spades, and have fun. Ace of Spades is Extremely Frickin Good, and is easily worth the hassle of tracking it down. It has a killer set of perks that work beautifully in concert with one another, both in PvE and PvP. 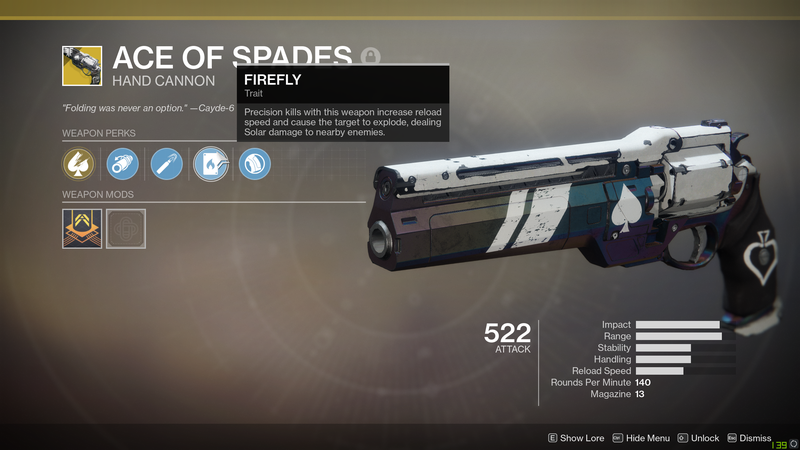 Its Firefly perk is really a combination of Destiny 1’s Firefly and Outlaw perks, notably the two perks on the first game’s beloved Fatebringer hand cannon. It keeps your radar active as you aim down the sights, which is a huge boon in the Crucible. I highly recommend taking the time to do the Ace of Spades quest, even if you find the first step frustrating. Not only will you hone your Destiny skills and get closure for the death of a well-known character, you’ll be rewarded with a sweet, glowing revolver that emits ethereal smoke from its super-powered bullets. Good luck.